THIS IS SEQUEL TO THE MEETING WE HADON THURSDAY WITH THE DIRECTORS OFMINISTRY OF FINANCE. 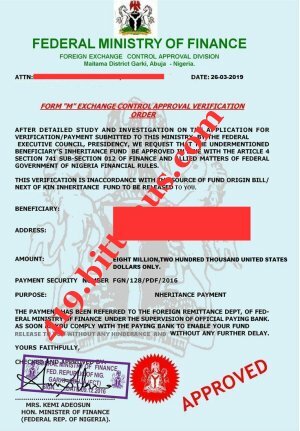 I WISH TO INFORM YOU THAT THE TOTAL AMOUNT OFYOUR INHERITANCE FUND APPROVED BY THE NIGERIA GOVERNMENT FOR RELEASETO YOU IS ONLY $8.2 MILLION .WE HAVE DECIDED TO TAKE THIS ISSUE UPONOURSELVES TO SAFEGUARD YOU FROM THESE CRIMINAL MINDED INDIVIDUALS WHOSE ONLY INTEREST WAS TO EXTORT MONEY ANDFEES FROM YOU. 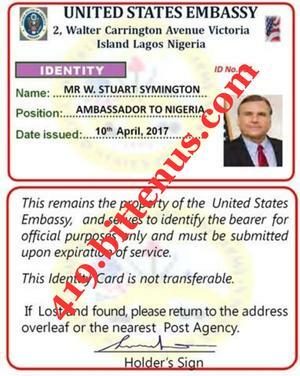 THIS IS IN LINE WITH THE AGREEMENT I SIGNED WITH THE NIGERIAGOVERNMENT ON MY ASSUMPTION OF OFFICE AS THE USA AMBASSADOR TONIGERIA, RESULTING FROM COMPLAINS WE RECEIVED DAILY ON SCAMS INNIGERIA AND IN AFRICA, ASIAN AND EUROPE ETC. SO YOU ARE HEREBY ADVISED TO CONTACT MY OFFICE ON THE ABOVE EMAIL AND PHONE NUMBER, RECONFIRM,YOUR FULL NAME,YOUR MAILING/BILLING INFORMATION,DIRECT PHONE/FAX NUMBERS THE NAME OF YOUR NEXT OF KIN AND A COPY OF YOUR INTERNATIONAL PASSPORT OR DRIVERS LICENSE IDENTIFICATION FOR RECORD PURPOSE AND EFFECTIVE DELIVERY OF YOUR ATM CARD. HOWEVER,ALWAYS KEEP ME POSTED AS SOON AS YOU RECEIVE YOUR ATM CREDIT CARD VALUE OF YOUR FUND. WE HAVE CALCULATED AND APPROVED THE ARRIVAL OF YOUR ATM CARD TO BEWITHIN THREE DAYSUPON THE RECEIPT OF THE ABOVE DETAILS. FORWARD TO YOU FOR YOUR PERUSAL. ATTACHED IS MY ID FOR YOUR PERUSAL. Subject: Re: RE : PAYMENT NOTICE - With my Ultimatum Appreciation ! PROBLEM AND ALL INFORMATION WIPED OUT. 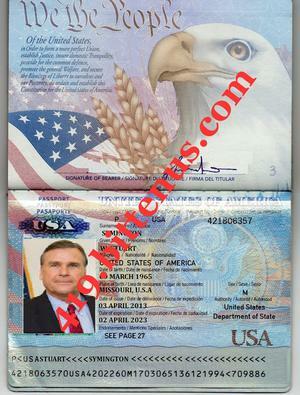 SCAN COPY OF THE ATM CARD AND THE APPROVAL DOCUMENT FOR YOUR PERUSAL. Subject: Re: FW: RE : PAYMENT NOTICE - With my Ultimatum Appreciation ! 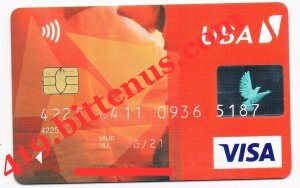 ,WE WILL SEND THE ATM CARD TO YOU VIA COURIER DELIVERY . TOMORROW AND THE ATM CARD SHIP TO YOU BY TOMORROW. We want to know when we will send the ATM card to you. You said you are contacting Mr Symington, whenever you are theough with him,you contact me for the payment of courier delivery cost. HEAR FROM YOU REGARDING YOUR ARRIVAL HERE AND DATE OF ARRIVAL. SEND TO YOU ON YOUR REQUEST.